The end of the world is nigh, and we’re going out with a bang with a mondo 90 minutes of audio theater madness celebrating the ‘leave nothing for tomorrow for there is no tomorrow’ fatalistic hopes of the likely to be uneventful Mayan Apocalypse. First up on our roster, a taste of Jazz Book on Tape by Jason Samilski, a romping, erratic, jiving and growling exploration of the post-industrial age combining voice, effects, and music. We then have Phil Proctor, founding member of The Firesign Theatre who eulogizes the late Peter Bergman and details Bergman’s explorations of Mayan ruins in Mexico on an episode of Joe Bev’s Comedy-O-Rama hour. 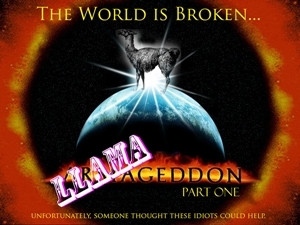 Next is the absurdist irreverent comedy Llamageddon, produced by Wireless Theatre Company and written by the aptly named No Cause for a Llama. The end of the ages is at hand and … seriously, you think THESE guys can stop it? Wrapping it all up is Ancient Evil, a short piece by Monique Boudreau released by Aural Stages’ Dialed In series. When an ancient Aztec curse is released in the archaeology lab, who on campus is responsible for cleaning up the mess?